Welcome to Old Louisville - Downtown! Louisville is the largest city in the state of Kentucky. It is located along the border of Kentucky and Indiana, with the Ohio River separating the two states. The Louisville metropolitan area is also referred to as Kentuckiana which includes counties in Southern Indiana. The city of Louisville was founded in 1778 by George Rogers Clark and is named after King Louis XVI of France, making Louisville one of the oldest cities west of the Appalachian Mountains. Louisville today is well known as the home of the Kentucky Derby, the first of three annual thoroughbred horse races making up the Triple Crown. Other Louisville attractions include the Louisville Slugger Museum, Fourth Street Live, The Palace, Kentucky Center for the Arts, Slugger Ball Field, The Great Lawn, Derby Festival Thunder Over Louisville, Derby Balloon Festival, Muhammad Ali Center along the Riverfront, The Belle of Louisville Steamboat, Louisville Extreme Park and The Louisville Waterfront Park. Old Louisville is the historic district and neighborhood in central Louisville. Old Louisville's National Historic Preservation District is America's largest Victorian Neighborhood, and features almost entirely Victorian architecture. The neighborhood also has the highest concentration of homes with stained glass windows in the U.S. Old Louisville consists of about 48 city blocks located north of University of Louisville. 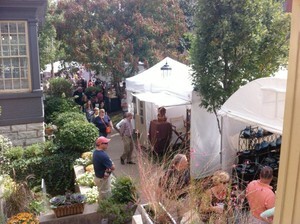 On the first weekend of October each year Old Louisville hosts the the renowned St. James Court Art Show. It is estimated that over a quarter of a million people attend this Arts and Craft Show that began over 5 decades ago and attracts more than 750 artists from all over North America.